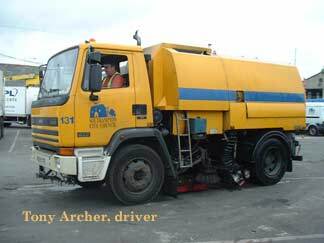 I spoke to Tony Archer and Bob Rowe, two of the sweeper operators involved in the recent sweeper purchase process. Earlier in the day, when I ran into them while taking photos, they expressed a keen interest in hearing more details on how this new type of regenerative air sweeper would, from an environmental perspective, help keep the streets cleaner. As I explained the details of how a higher level of pollutants is contained in the smaller 'bits,' as one would say in U.K., they listened intently and interjected thoughtful questions. Both were clearly interested in the job they were doing, and how they might do it even better. "We were due for some new machines, since the lease was up on our Johnstons. They sent us to the tradeshow to look at all the other machines, and learn what else was available. We came across the Schwarze and could see that it was a whole new concept. We had a good look, and we were totally impressed with the lack of moving parts. For example, it didn't have a channel [gutter] brush cable, which often snaps. We wanted to know more. "We talked to Malcolm Cameron, who was there representing the Schwarze sweeper. He went over the machine with us as he explained how it worked and the power of the [regenerative air] concept. It was absolutely amazing. We took it all in, but we actually found it hard to believe. 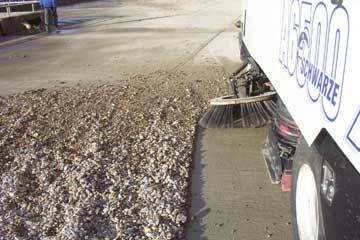 Then we went on our way, but got him to drive down with the sweeper so we could give it a look on the job. "Malcolm brought it down during our heavy leaf season. Where the Johnston struggles with that, the Schwarze just gobbled up the leaves straight--away. It took them all up in one stab, where we were used to making two or three tries. It was a whole new concept. And, of course, the environmental part is quite high on our agenda. Until now, we haven't been aware of the environmental part -- the reasons to get up as much of the small bits as we can. That's something we'd never heard about, and never considered in our trade, until we read up on the reports Malcolm gave us. "We get chunks of wood and all sorts of stuff during that time of year and nothing stopped the Schwarze. Usually we're getting out of the cab several times a day to unblock the sweeper tube, and that wears you down. But, with this machine, nothing seemed to stop it. We'd find the dirtiest places we could and, I gotta say, we did give it a bit of a pasting. It left the Johnston standing, unfortunately -- or fortunately, I guess, because now we get the Schwarze sweepers as our new ones. "The hardest part was convincing the transport management and the corporate procurement officers to go with the Schwarze machine. We couldn't get them interested at first, but we kept niggling away at them. It looked too simple to work well, not having the brushes and all the apparatus. It was so different, and all we've ever had is Johnstons; they're all that was available. "Plus, we had a problem in the past with a sweeper manufacturer who came in and really fell down with their customer service, promising spare parts but couldn't deliver them, that sort of thing. The company just didn't deliver the goods, so the management was afraid to give a go with anything except another Johnston. Once we convinced Jon Dyer-Slade that the machine was worth looking at, he did, and here we are today getting the Schwarze as our replacements." Editor's Note: Unfortunately, and for reasons unknown, Schwarze Industries, Inc. pulled out of the U.K. marketplace shortly after this article was written, much like the company cited above, it would appear. Since Schwarze had spent considerable resources first in 'enlightening' the public works people of U.K. about the many advantages of regenerative air sweeping, this left the door open to other regenerative air manufacturers to come in and fill the gap left by the Schwarze pullout. As of early 2005, it appears that Elgin is the primary recipient of Schwarze's leaving the U.K. market.